I take care of patients who suffer from hematologic cancers: leukemias in particular, and patients who undergo bone marrow transplantation. In answer to the question in the title, I would say that the patient is a person, whom is asked an unexpected and mysterious sacrifice. Life is turned upside-down. No matter if you are rich or if you are poor, if you are a famous or an unknown person. A new self-perception identifies something evil in one’s own body, and strangely, something good surrounding you: people (caregivers/medical staff), who may unexpectedly respond to your strong need of health. There is a limit in your body, a disorder, which tries to dissect, to divide the unity of it (disease is always an interruption of a functional part in the organism), and there is a surrounding reality, trying to recompose the unit. A sick person usually feels very naked. The usual structure of life with its habits cannot protect anymore the dramatic experience of the “I.” Looking at my patients, one of the questions I often ask to myself while in front of them is: what is being asked of you? What does this mysterious event ask you? A Christian gaze tries not to interrupt the deep dialogue between the Mystery and the person. I would like to exemplify this in the simple description of some encounters with my patients in the Hematology Division where I work. There was an old farmer, who came into the Hospital. All he had experienced in life was taking care of his family, his animals, and his fields in a small town in the mountains. When I told him the diagnosis of leukemia, he burst into tears, telling me that I had no idea how homesick he was (after one day), and for him it was better to die, than to remain in a closed room for receiving therapies. So I tried to console him, and instead of explaining the ten pages of informed consent, I only promised him that everything would be OK (I told that to my chief the next day and…fortunately… he said, “Of course, what else could you tell him...!”). With patience I convinced him that it was good to try to get a cure, and hopefully this sacrifice would allow him to go back to his family and his cows. At the same time, while spending all my energy to facilitate his permanence, I daily faced in front of him a mysterious gap: there was nothing I could do to stop him crying like a child. And he was crying, and accepting to stay, at the same time. What God was asking him was incommensurable, and neither of us possessed the answer. There was a young man coming from eastern Europe. He did not speak a word of Italian, his parents put him on a flight to Italy, where he had a sister, because nobody in his hometown understood what he had, and in that place he was doomed to die. Without a penny to pay for medical care, he was looking at us from his bed, suffering and grateful, while he was receiving his therapy (we didn’t know how we were going to pay for it either, but we started anyway…), and had a chance to heal. What is God asking you? I often thought: in a foreign land, abruptly detached from your life, but with a chance to heal. There was a 16-year-old boy, who came breathless, because of a neck lymphoma which was almost suffocating him. He was barely looking at me, when I was trying to explain him the diagnosis and the program. It was evident he was feeling entrapped in a situation which was bigger than him. The boy – his mother later told me – suffered a lot in his life. The father abandoned the family very early, and they suffered in every sense: emotionally, and physically, because they did not even have the money to pay the heating in winter. At the age of four the boy started assuming the role of “father of the family,” trying to help and console his mother, who was very depressed. Before learning to write, he drew a picture of the family, symbolizing himself as an angel. While talking to me, this woman was crying, not only for her painful story, but also because she was feeling guilty. She was convinced that the origin of the disease was the distress in the family. I went back to the boy, and asked him if he did want to undergo therapy, a big and long sacrifice, with the goal to be cured and go back to normal life. He looked at me very seriously in the eyes and answered a courageous “yes.” And I thought: you’ll see, if God wants, you will go back to a lot more than your ordinary life. You’ll enjoy the meaning of things, of study, of family, a hundredfold more than your friends of the same age. The patient is called in front of the Mystery, and the one who is in front of him has the enormous privilege to be involved as well in this call: the privilege to accompany the person in this journey, and to remain with the person in front of the Mystery. One of the most common feelings a physician has is the disproportion. You are given responsibility for the life of a patient. It is completely disproportionate. “The first duty of the physician is to ask for forgiveness from the patient.” The very simple cry for health of the patient is per sesomething disproportionate. Its truth is a cry to God: heal me! This cry totally surpasses the human possibilities of the physician. The truth of the physician’s work – in my experience – is the participation in this mysterious cry for salvation. The chemotherapy worked well for her, and the leukemia was soon in complete remission. Fortunately she had a brother whose compatibility genes were fully matched with her, so she underwent bone marrow transplant and everything went fine. Not even three months after the transplant, she came in the outpatient clinic, telling me that she was feeling very sick. Leukemia was back, and I had to inform her. When I spoke to her, she replied very seriously: “You guys all do your best to heal us, but when God calls, we have to go. Will I die?” I replied that I did not know, but I promised her to do my best to offer her another chance with an experimental therapy. And I really did my best, I also argued with almost all my colleagues, who did not want to proceed with the cures, judging them wasteful. At the end I came up with a cell therapy program, and the chief agreed. It is very interesting actually to follow this dynamic: in these extreme situations, there is often one person (one is enough), who proposes the “last ditch attempt,” and the human heart is made for hope so much, that all of a sudden the attempt is welcomed, or at least not discarded. She was sincerely moved. It was probably the first time in life she experienced anything like that. She had never entered a church in her life. I was very moved as well, seeing her like that. It is impossible to be joyful in this situation. You cannot in any way force yourself alone to be joyful when you fear to die. Only a presence, an event has the power to move you. The day after, I entered the room to tell her that the bone marrow showed another leukemia relapse. She was at peace, and for the first time ever in my life, while communicating such a result to a patient I was at peace as well. To deepen the definition of “patient,” then, I would say that this person, of whom is asked a mysterious sacrifice, identifies both in the something evil in the body proper, and the something good surrounding him, contingent signs of the presence of the Mystery, who is calling him. What Place Does Technology Have in the Fate of the Patient? And what is the real meaning of research? “Research is an entreaty (from quaestio, quaerere). Man who does research is a man who seeks, who asks reality to reveal its secret. There are people who perceive a way to penetrate reality that makes them to proceed for three feet instead of the usual three inches. And everybody marvels – “three feet?” – while reality is infinite.… The truth of research – and here is its greatness, its nobility, its risk – is the comparison, the relationship with the Infinite. Man is a ‘need’ of comparison with the Infinite, with the ultimate meaning. “One who seeks does not even possess the necessary instruments to go one step forward: it is pure fortuity if one steps forward: is the bursting of factors, circumstances into his path, which one did not even dream about, did not even discover by himself. I quoted these pieces of Fr Luigi Giussani because they have been giving a direction to my whole perception of work for many years. The truth of my research, and of my work with patients, does not really differ from the truth of looking at myself, at my friends. If I am forgetful of Christ in my gaze, I will be forgetful in my looking at myself, and at my patients, and at my experiments. The same degradation I will use in trying to possess a friendship, instead of respecting the freedom of the other, will also spoil my looking at the results of my experiments, and the use of technology in my work. When does technology loose its balanced place in health care, to gain a violent dominant position? 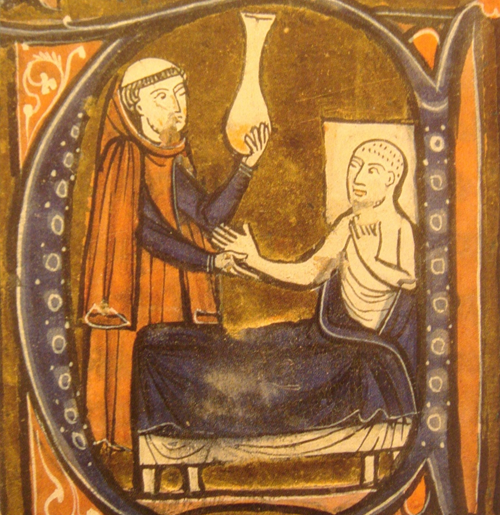 When the health care relationship ceases to be a dialogue exchanged between two subjects, because the physician abandons this totalizing relationship with the patient, or because the patient hides him/herself from the dramatic perception of the “I,” and the mysterious Unknown bound with it. Without a human subject to confront, technology occupies the leading position. When they lose the perspective of the whole human being, both doctor and patient entrust the care relationship to a mechanistic approach. Two different reasons, in my view, lead the physician to this distortion: first is the overloading burden of the human relationship, where the doctor clearly feels unable to answer the need of the patient. So he steps back. It is very comprehensible, and it often happens to me as well. It is a sort of discouragement – if you want, a “burn-out” feeling. The second reason counteracts this disproportion in the opposite way: it is the presumptuous (and blind) attempt to demonstrate that with the power of technology we will measure all things, and eventually put everything under control. It is the human attempt to be lord of reality, and I recognize this temptation in me as well. “Do not worry, I will take care of your fever with the right antibiotic.” It sounds encouraging, of course, if it is pronounced with charity towards the patient, but there is another way to intend the concept: I have the power to heal you. It takes a strong love of reality to be faithful to it, to take all its factors into account, without forgetting to count anyone or anything. If you see a tree branch with a hundred and one little leaves, it takes a loyal effort to count them all, to be sincere. If you arrive to count a hundred of them, and you affirm, “This branch has a hundred leaves,” you are being presumptuous. The same attitude leads you to believe that you possess reality. You have to forget some piece of it, if you are to pretend that you control it. To transform your work into a possession of reality is a real temptation, if you do not humbly value the truth of things more than your attachment to your idea of them. The patient ceases in this case to be a subject, a person, with whom you walk a stretch of road, and becomes the object of your possession, and technology is your means of control. The piece of reality you have to forget in order to proclaim yourself the lord of reality is actually what makes reality so beautiful. It is the unexpected sign, emerging from the experience. It is that something greater, that something you cannot measure, to whom you belong. It is is the loving order of everything; and above all, it is talking to you unceasingly. Put all things under his feet” (Psalm 8). But why does God value the small action, the instant that passes, when man tries to express himself? Because man is constituted by a relationship with him. The whole cosmos reaches a certain point of evolution or of qualification in which it becomes self-aware: that point is called “I.” The “I” is the world’s self-awareness, the self-awareness of the cosmos, of itself. And so the cosmos as it is in reality is the context in which the relationship with God lives, the relationship with the Mystery lives. Translation from L. Giussani, Vivendo nella carne: Quasi Tischreden (Biblioteca Universale Rizzoli, 1998), pp. 155-58. Translated from L. Giussani, “Natale: motivo della vita come lavoro” (Litterae Communionis-Tracce: 11, December 1998), p. vi.